Cruel efforts under Stalin to impose collectivism and tamp down Ukrainian nationalism left an estimated 3.9 million dead. At the height of the 1932-33 Ukrainian famine under Joseph Stalin, starving people roamed the countryside, desperate for something, anything to eat. In the village of Stavyshche, a young peasant boy watched as the wanderers dug into empty gardens with their bare hands. Many were so emaciated, he recalled, that their bodies began to swell and stink from the extreme lack of nutrients. “You could see them walking about, just walking and walking, and one would drop, and then another, and so on it went,” he. “Stalin appears to have been motivated by the goal of transforming the Ukrainian nation into his idea of a modern, proletarian, socialist nation, even if this entailed the physical destruction of broad sections of its population,” says Trevor Erlacher, an historian and author specializing in modern Ukraine and an academic advisor at the University of Pittsburgh’s Center for Russian, East European, & Eurasian Studies. Collectivization in Ukraine didn’t go very well. 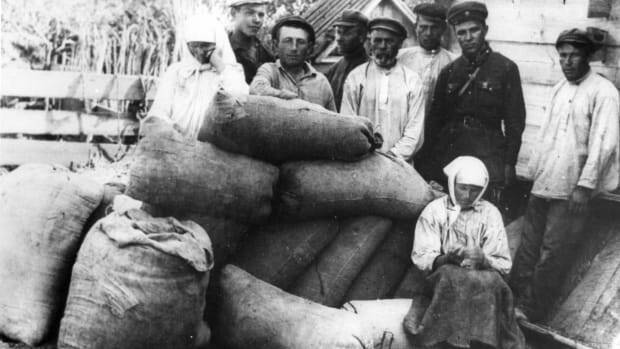 By the fall of 1932—around the time that Stalin’s wife, Nadezhda Sergeevna Alliluyeva, who reportedly objected to his collectivization policy, committed suicide—it became apparent that Ukraine’s grain harvest was going to be miss Soviet planners’ target by 60 percent. There still might have been enough food for Ukrainian peasants to get by, but, as Applebaum writes, Stalin then ordered what little they had be confiscated as punishment for not meeting quotas. “The famine of 1932-33 stemmed from later decisions made by the Stalinist government, after it became clear that the 1929 plan had not gone as well as hoped for, causing a food crisis and hunger,” explains Stephen Norris, a professor of Russian history at Miami University in Ohio. Norris says a December 1932 document called, “On the Procurement of Grain in Ukraine, the North Caucasus, and the Western Oblast,” directed party cadres to extract more grain from regions that had not met their quotas. It further called for the arrest of collective farm chiefs who resisted and of party members who did not fulfill the new quotas. An armed man guards emergency supply grain during the Ukrainian famine of early 1930s.